Due to hand-crafting, no two are alike. Our fashion red mini is great to use in any decor to bring that pop of color and fun crafted in cut plastic our 4-light mini comes with a swag kit, it can also be hardwired if needed. 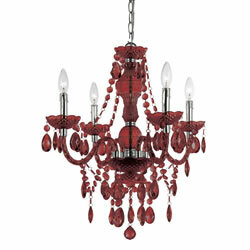 Dripping with lots of teardrops and beads making this a fun item in your decor. Some assembly required.